Cyberstalking describes stalking behaviour in which a person follows or harasses another through use of the internet, emails, intranet or related electronic media. It is to be assumed that cyberstalking will increase further with the spread and matter of course use of these technologies. Cyberstalking can occur independently or be a part of stalking, in which additional conventional stalking behaviour occurs (Hofmann, 2006). – Spying, manipulating or damaging passwords, computers, email accounts or websites of the person affected. 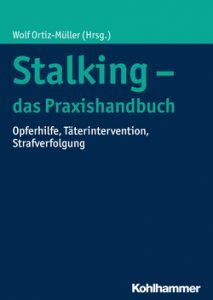 The phenomenon of cyberstalking posseses a few particularly negative characteristics, which facilitate the occurance, continuance and escalation of stalking behaviour. Thus, publicity can be established through the internet, third parties can become involved, and real campaigns can be initiated against affected persons. The low threshold of stalking cases being dealt with also plays an important role: contact can be made independent of time and wherabouts, as well free and anonymously, and does not require personal contact to the affected person. The lack of real contact prevents the development of empathy for the stalked person. Through the lack of social controls, emotions such as anger, jealousy and need for power are not restricted and regulated, but can be freely acted out. In addition, the increased activity with the virtual world of the internet can facilitate the construction of relationships, as well as a loss of reality.